Boy am I glad we are missing this. It might be fine if you could just stay inside all the time and just look out the windows. However, life doesn't work that way usually. Dogs have to be walked. Your boss wants you at work. Groceries have to be purchased. Etc. Etc. 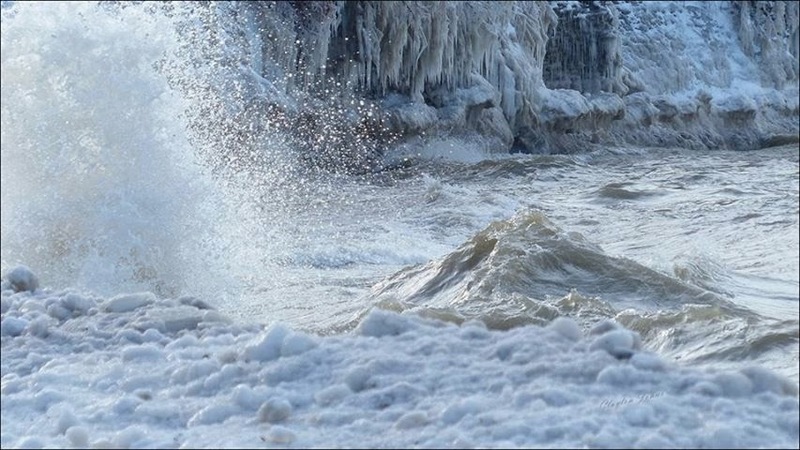 This is a picture of the North East Beach on Lake Erie taken in the last couple of days and posted by our friend Debby Wright. It has it's own kind of beauty but I would rather be looking at it than be out in it. The torrential rain that seems to have been going on forever (I am expecting to see animals going two by two any day now) and the flood is having serious consequences. This is just a picture to show you the magnitude. This is a lock on the river Thames which has been filled by the flotsam and jetsam of the floods that the UK has been experiencing. Now remember, these locks are about 7 feet deep. That is a lot of flotsam and jetsam. These little "bumps in the road" obviously mean that locks are closed until they can be cleaned out. So, if you are on the other side, well get comfortable there. Now, we are in the midlands (away from the coast as you might expect) and this area is also flooded, although not to the degree of coastal areas. Today Mike and I took what should have been a one mile walk into Tamworth to buy some groceries. The route that we should have followed had ducks and geese swimming along the foot path. Our alternative route was a little longer and resulted in our getting a little "damp" on our walk home. Oh well, at least it wasn't on the walk there. A warm shower and we are good as new.